Cristiano Ronaldo has shown off some fancy footwork of a different variety in an advertisement for his new line of shoes. His fancy footwork on the pitch is admired the world over, even winning him the coveted 2014 Ballon d'Or footballer of the year award, but recently, Cristiano Ronaldo has been showing off some footwork of a different variety. In an advert to promote his new line of shoes, CR7, the Real Madrid star swaps football boots for dancing shoes and shows off some dad-dancing that would not be out of place at many a wedding disco. The Portuguese captain suits up in the ad, during which he pays homage to Michael Jackson with a moonwalk then struts and twirls around in his new shoes. He impresses with some breakdancing, including a back flip and speeded up spinning on the floor. Ronaldo topped football's rich list on Thursday, with an estimated fortune of €210 million, beating his Barcelona rival, Lionel Messi, by €10 million. The Real Madrid striker's footwear range, released in collaboration with Portugal Footwear, feature shoes in adult and junior sizes, ranging from €99.99 for a 'basic' pair of desert boots to €549.99 for a pair of leather brogues. 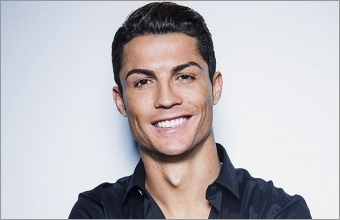 And Ronaldo's talents do not stop at football and dancing, he was recently filmed singing karaoke with Colombian singer, Kevin Roldan. The footballer was criticised, however, as his karaoke efforts came mere hours after Real Madrid suffered a crushing 4-0 defeat by rivals Atlético.